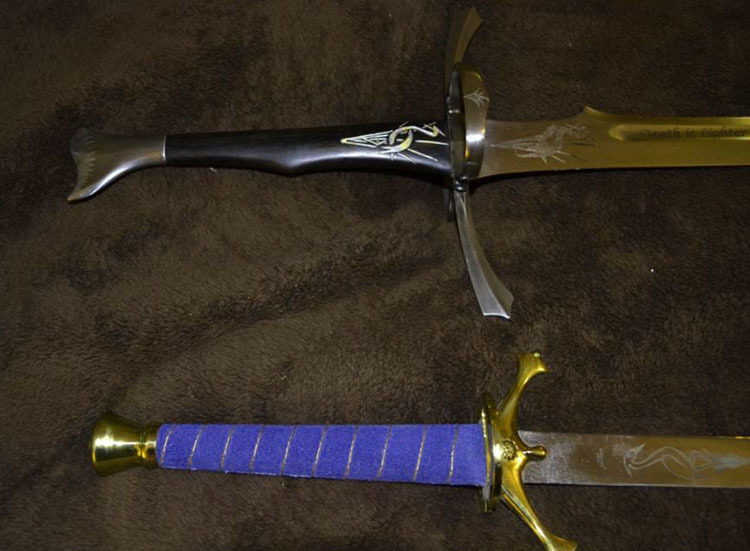 The replica Heron Mark sword by Windlass Steelcrafts is a faithful replica of the swords created by the fertile mind of Robert Jordan in his Wheel of Time series. 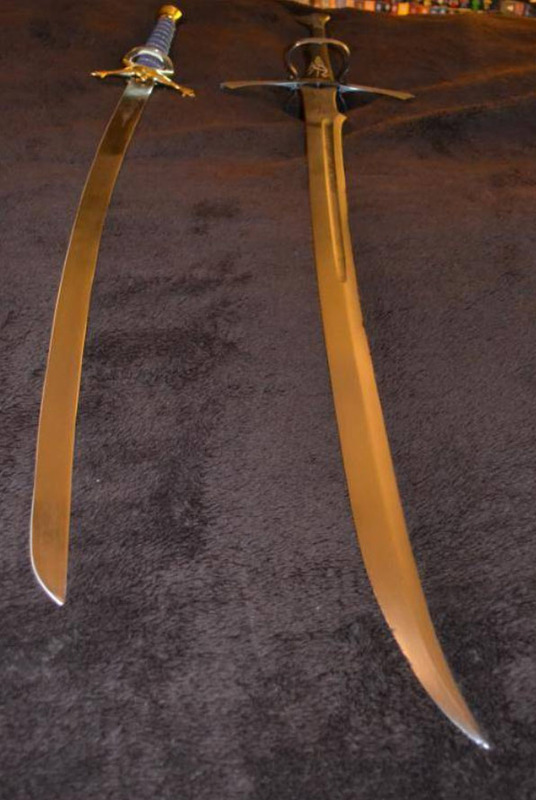 This is the sword from Robert Jordan's Wheel of Time fantasy novel series. One thing to note, if it's not obvious, it's not *THE* Heron Mark sword. As in, it's not the Heron Mark sword originally owned by Tam. That had one heron on the grip, one heron on the blade, and one heron on the scabbard. This has only the two herons on the blade. But since there were other heron marked swords, this can still be "accurate". So, what attracted me to this sword? Well, the WoT series are my favorite books, so a sword from the series is great! I was considering buying it for a long time, and then my girlfriend got it for me last Christmas. My girlfriend got the blade unsharpened, and I'm fine to keep it that way. For me, it's just something from the books that I can see, not something to go out and cut with. 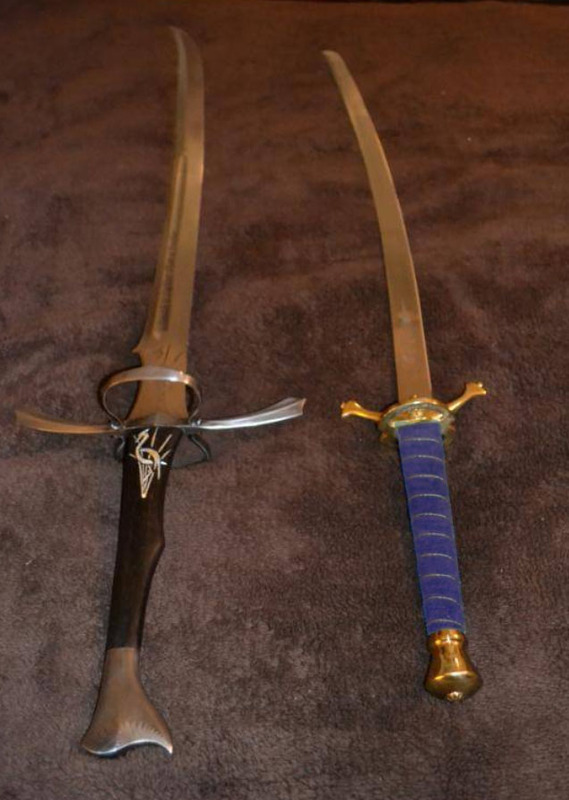 I have other swords for that =D. The sword overall doesn't feel that "solid", so I doubt I'd cut with it even if it were sharpened. That being said the blade seems decently constructed. 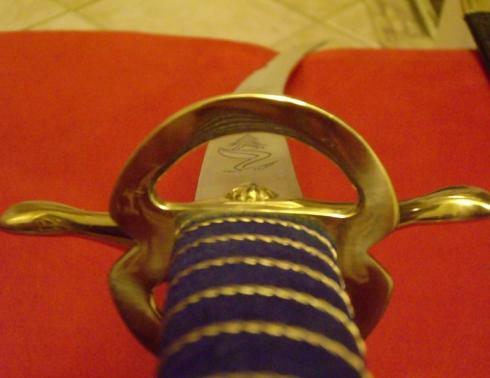 A single heron is etched on either side of the blade, about 2" from the guard. Below one of the herons "Windlass India" is also etched into the blade. Kind of annoying. Something that I dislike about the blade is that the thickness of the blade is not perfectly even like I'm used to with katana. I've been told that's normal for European blades, but for me, I'd prefer if it was a little more katana-like in this aspect. This is a very minor issue. It's wrapped in a material that's sort of like suede, but rougher. Or like rough leather, but softer. Not sure what it actually is. It's then got a wire wrap on top of that. The base material is blue, and the wire wrap is gold-colored, and the combination looks very nice. The wire doesn't really sink that deep into the base material, so it's a little abrasive on bare hands when swinging, but not terribly so. 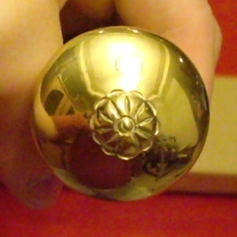 The bottom has a little emblem that's sort of like a chrysanthemum emblem, or maybe just a wheel design. Not too much to write about here, see the image. It's got something like a 'musashi-style tsuba' with quillions coming out on top of that. 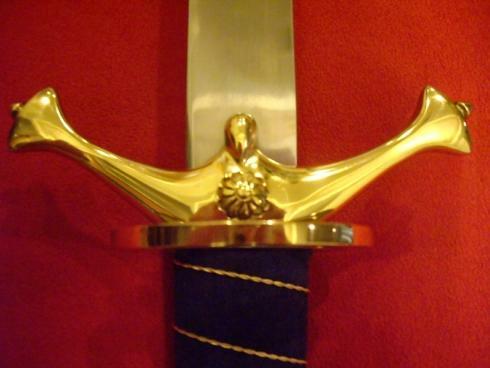 It's made of brass that looks great with the rest of the sword. There is another chrysanthemum emblem on the guard as well. The throat and the chape are (I assume) brass (it's thin, hard to tell. It could even be plastic), and the rest is black "leather". No idea if that's real leather or not. The guard fits snugly into the throat, see the second to last image above. 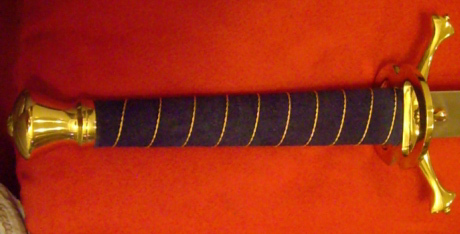 That's all there is to the scabbard, no belt attachments or anything, but doesn't make any difference to me! A must-have for any sword-loving WoT fans! It's your very own well-made heron mark sword. Hard to go wrong with that. I had a request to review the sword, but I guess since I didn't have any cutting reports or input on the construction it ended up being more of a detailed description than a review. Oh well, hope this helps someone out.